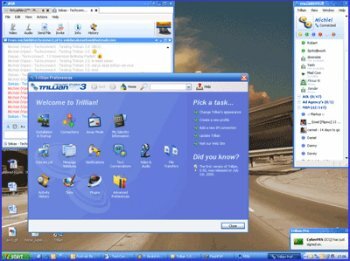 Trillian is a multi-network chat client that currently supports IRC, AIM, ICQ, MSN, and Yahoo! Messenger. It supports all of the features you've come to expect from a good IM client, including but not limited to docking, multi-line edit boxes, buddy alerts, multiple connections to the same medium, a powerful skinning language, easy importing of your existing contacts, skinnable emoticons, logging, "global" away/invisible features, and a unified contact list. It is completely free with no nag screens or built-in ads. Never thought I would be back using this, not that it was a bad software. Just that most old IM's are kaput. I'm using it for facebook im. Facebook gets allot of things right, but the im is pretty lame. I had never used Trillian for FB instant messaging. Wasn't sure if was included. It is included and works well. Other programs like Pidgeon and Miranda don't directly let you access FB im. Though with a ton of bells and whistles u can get it to work. Here with Trillian it was easy and works good. remember when people used to instant message..? i'd still be using trillian if people still instant messaged. Still awesome!!! I use it for Skype, LinkedIN and Twitter. Great interface for the advanced user. Not sure what all the complaints are for. It does what is says. You can add those old IM services all to this 1 software. Sure, most of my friends stick with facebook im, but for the few who dont, this saves me from having to install icq, yahoo msg or aim. As far as bloat, where? Not getting any secondary software installed, no pop up ads. As below MSN/Live gets switched off in the spring, with the likes of Sype where can this program go, apart from the fact it's a shadow of it's former self. Many of the platforms Trillian supports are a dying breed. I miss ICQ back in the day, but only two of hundreds of friends use it yet. Yahoo, MSN, AIM... sure, I'm aware people still use them, but at what fraction of the pre-Facebook era? This latest version of Trillian is bloat for a dying medium. iPad version finally released not long ago and I have to use for it, the iPhone/iPod version, or even the PC version any longer. Time for a new business model for the changing times. Good luck Cerulean Studios. Was good years ago now it's not there are other free smaller (open source) & none ad based programs that do the job as well. Aside from becoming adware, it's horribly bloated now. It's used to be the mother of all IM apps because of the ease of bringing multiple Im's together into one place, but there are several other out now that are TRULY free. multi IM capable, and even portable (USB key anyone) Check out Miranda or Pidgin. Trillian was a great concept, but sadly, now over reaching. 2 for posterity, and -3 for bloat, ads, and plain old "over it"